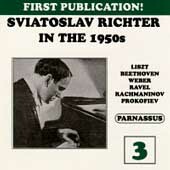 Sviatoslav Richter Live in the 1950s Five two-cd sets contain performances recorded at Moscow recitals from 1952 through 1958. 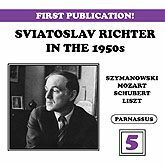 Volume 1(PACD 96001/2) recorded in 1954 and 1958, includes the only live concert peformances published of Richter playing two major works: Prokofiev's Piano Sonata No.7, which was written for him, and Tchaikovsky's Piano Sonata in G Op.37. Please click disk image for complete contents. Volume 2 (PACD96003/4) was recorded in Moscow in 1952 through 1957. All selections are previously unpublished on CD or LP, with the exception of the Scriabin Sonata No. 6, which now appears for the first time as part of the complete recital. This set includes the only live concerts appearance of Richter playing Schumann's Humoreske, Op.20, and the earliest one of him playing the Tchaikovsky First Piano Concerto. It also includes the earliest recording of Richter playing one of his greatest interpretations, Mussorgsky's Pictures at an Exhibition, in a virtuoso performance from 1952 which contrasts interestingly with his better-known Sofia performance from 1958. Please click on disk image for complete contents. Volume 3 (PACD96005/6) was recorded at Moscow recitals in 1954 and 1958. None has ever been published before on CD or LP. The 1958 material included some major discoveries. Most of it is made up of pieces from Liszt's Années de Pélèrinage, only one of which exists in any other Richter recording. It also offers the offers the only live performance published of Richter playing Beethoven's famous "Pathétique" Sonata. The 1954 recital includes mostly works of Ravel, including the published Richter performance of Le Gibet from Gaspard de la Nuit , the only selection of that suite he ever palyed. Two more of the Ravel works, Pavanne pour une infant défunte and Jeux d'eau , are the only Richter performances yet published on CD. The disc concludes with three pieces by Rachmaninov and one by Prokofiev. Please click on disc image for complete contents listing. 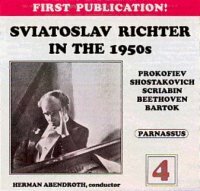 Volume 4 (PACD96013/14) was recorded at Moscow recitals in 1954 and 1956. the obvious highlight of this set is a 1954 performance of Beethoven's Third Piano concerto conducted by Herman Abendroth, during a visit to Moscow. It was Richter's only performance with Abendroth, and it crackles with ntensity. the other material is Prokofiev's Sonatas Nos. 6 and 9 and Gavotte from Cinderella, eight of Shostakovich's Preludes and Fugues (the largest group Richter ever played at one recital), Bartók's 15 Hungarian Peasant Songs,, and Scriabin's Vers La flamme and Poème. All of the recordings are previously unpublished. Please click on disc image for complete contents listing. All recordings were digitally transfered from the original open reel analog tapes. They were then processed by Gregory K. Squires Music Productions, using the Sound Forge noise reduction system.